Scully: Maybe it's another show, like the Outer Limits? Mulder: Confuse the Twilight Zone with Outer Limits? DO YOU EVEN KNOW ME??? Permalink: Confuse the Twilight Zone with Outer Limits? DO YOU EVEN KNOW ME??? Scully: Are you that guy that met with Mulder last night? Guy: What gave it away, Sculls? Scully: He mentioned the forehead sweat. Permalink: He mentioned the forehead sweat. Mulder: It's the Mandela Effect. Mulder: The Mandela Effect, when someone has a memory that doesn't coincide with everyone else's or the facts, so named because some people have a memory that Nelson Mandela died in prison in the '80s when in fact he died a free man in 2013. Reggie: No. It's called the Mengele Effect because people have the memory of Josef Mengele being apprehended in Ohio in 1970, so it's the Mengele Effect. 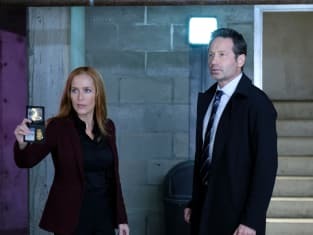 Mulder: The Mandela Effect has been an internet meme for almost a decade. It's ALWAYS been called that. Reggie. Eh, see? You're having a Mengele Effect about the Mandela Effect. Do you know who I am? I'm Fox Mulder. I was fightin' the power and breakin' conspiracies before you saw your first camp trail, you punks! I'm Fox freakin' Mulder, you punks! I'm Fox Mulder! FOX MULDER!! Mulder: So that's the truth? We're not alone in the universe, but nobody likes us? Scully: It's OK Mulder, we'll always have more X-Files. Mulder: No. They gave us the answers to everything, even Sasquatch! No! It's not true!! Permalink: No. They gave us the answers to everything, even Sasquatch! No! It's not true! !